February 14, 2017 – Windor, Ontario Mayor Drew Dilkens is back home after meeting with Beam Suntory executives in Chicago Monday hoping to keep his city’s Canadian Club Heritage Centre open. 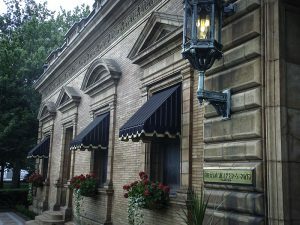 The mayor met with CEO Matt Shattock and other company executives in what Beam Suntory termed a “constructive discussion.” However, there appears to be no change in the company’s plan to close the Canadian Club brand home to public tours March 31. WhiskyCast has contacted Mayor Dilkens to follow up on the meeting, and we will update this story as more information becomes available. As we reported last week, Beam Suntory plans to reinvest the money it spends on the Heritage Centre into other promotional efforts for Canadian Club, both in Windsor and globally. The museum attracts around 15,000 visitors annually, and the Canadian Club brand has played a major role in Windsor’s history since Hiram Walker opened his distillery in Windsor in 1858. The Heritage Center occupies the old Hiram Walker & Sons headquarters building adjacent to the Hiram Walker Distillery along the Detroit River. Beam Suntory’s predecessor, Fortune Brands, acquired the Canadian Club brand in 2005 as part of the breakup of Allied Domecq. However, Pernod Ricard’s Corby Spirit & Wine unit would up with the distillery, and signed a 99-year lease with Beam for the headquarters building along with a long-term production contract to supply whisky from the distillery for Canadian Club. While Beam Suntory has confirmed that – barring a change in plans – it will terminate its lease on the Heritage Centre building at the end of 2017, Corby executive Ross Hendry told WhiskyCast in an email that his company has not received any notice from Beam Suntory on those plans. According to Hendry, it is “too early to speculate on any future plans or activities” for the building housing the Heritage Center. However, Hendry emphasized that Corby and the Hiram Walker Distillery, which produces Corby’s J.P. Wiser’s and other Canadian whisky brands, “have always been – and always will be – committed to Windsor.” Corby has never opened the distillery to public tours, but recently opened a Wiser’s training center at the distillery that could eventually become the base for a tour program.